That the Red River Settlement was for nearly five decades the Hudson's Bay Company's major supply centre for men and provisions made it central to the transportation system of the fur trade. In addition, the fur trade experienced a transportation revolution that replaced Norway House with Red River. This revolution entailed a change in both the mode and the routes of transportation. From the 1820s to the 1860s, furs and supplies were moved by a system of York boat brigades, the canoe having been discarded in favour of the boat after the union with the North West Company in 1821. At specified points inland, returns of furs were exchanged for outfits of trade goods, the two brigades returning to their respective starting points before the rivers froze over. Only in this way could the vast distance of the fur trade empire be spanned in the short navigation season. The commercial use of the Red River cart on the trail from St. Paul, Minnesota, to Red River was the first step in a significant transportation revolution which rendered obsolete the river route from York Factory, leaving the upper and lower forts even more central to the Hudson's Bay Company's trading system. The pioneers of the new route were free traders, and their trade grew alarmingly after the Sayer trial in 1849 showed the Company's inability to enforce its monopoly. By 1854, these interlopers were even trading on English River, deep in Hudson's Bay Company territory. In 1852, the first American railway reached the Mississippi, thus increasing the speed and economy of the southern route and its inevitable triumph over the northern route.10 Goods could then be shipped by rail from New York to the Mississippi, by steamboat to St. Paul, and thence to Red River by cart train. The increasing volume of trade and the new necessity of competition accentuated the faults of high cost and low capacity on the York route. Steamboat traffic eventually displaced the cart trains. The carters moved northward and in the 1870s worked overland between Edmonton and Upper Fort Garry. The steamboats themselves were overtaken by the railroad in 1878 when the south branch of the Canadian Pacific Railway was completed. Goods imported by the southern route were made up into inland packages not at Norway House, but in Red River. Lower Fort Garry became the transshipment point for northern destinations. This was not because the St. Andrew's rapids between the two forts prevented trans-shipment for northern destinations at the upper fort. The Lower Fort Garry journal beginning in 1868 contains several references to York boats and river steamers travelling between the two forts.21 If the river's water level was low, cart trains were used.22 The significant factor seems to have been that different kinds of craft were used on the river and the lake. According to the journal, steamers from the lake or upper settlement never passed beyond Lower Fort Garry. It is probable that inland packages sent out from the lower fort were made up there from baled goods, since to have prepared them at the upper fort would have involved another costly and time-consuming step in the business of transshipment. The Company's small sloops on Lake Winnipeg were dwarfed by the schooner which was added to the fleet in the 1860s. Large vessels from the lower fort began to meet the Saskatchewan brigade at Grand Rapids and deliver goods and provisions at that point. The Chief Commissioner, first steamer on the lake, was launched in 1872. 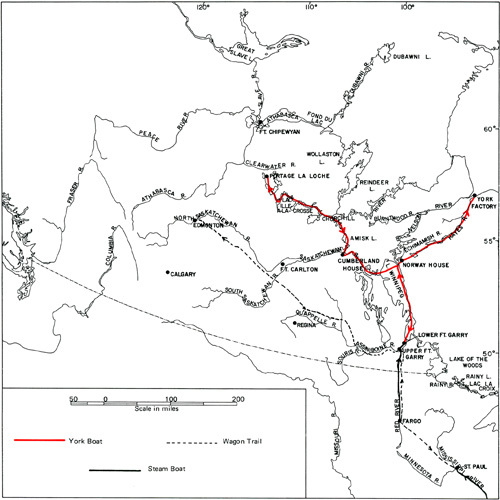 In 1874, the Northcote began operation on the Saskatchewan and in 1877, a tramway was constructed over the Grand Rapids portage. Thus the southern route gradually replaced that from York Factory, and the two forts Garry divided between them the functions of Norway House as inland depot. Sloop, schooner and lake steamer in turn had enhanced the position of the lower fort as distributing centre for the vast regions that drain into Lake Winnipeg and thence to the Bay.